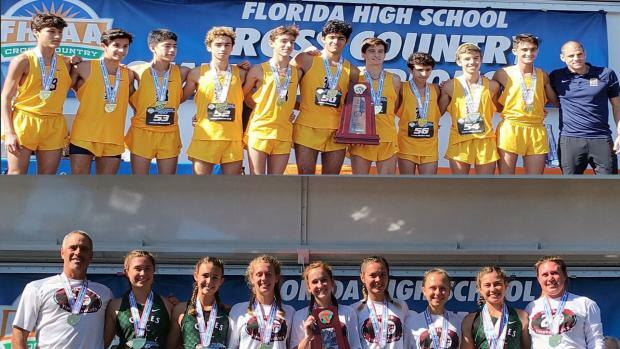 The Belen boys and Chiles girls demonstrated they are two of the top teams in the state with their back to back team titles. Belen took home their 10th team state title, making Coach Frankie Ruiz the second coach on the boys state team titles all time list. Ruiz is now just behind Brent Haley who coached Largo HS in the 1970s and 1980s. Belen took the first two spots in the boys race with sophomore, Javier Vento, having an incredible breakout race setting a new PR of 15:39.98 to take home his first individual state title. Freshman, Adam Magoulas, finished in a close second with a time of 15:41 to finish out the 1-2 punch. From there, the rest of the team packed it up with Lucas de la Hoz (16:14), Diego Gomez (16:16), Sebastian Roa (16:24), Giancarlo Benitez (16:29), and Cesar Aguzzi (16:30). Seven athletes all in the top 20 at the state meet and all at or sub 16:30. The south Florida power house won the team title with 35 points -- 135 points ahead of second place, Chiles HS. Over the summer, we predicted Chiles would finish second in the FHSAA state finals. Week after week, win after win, these ladies have proved us wrong. In the 3A girls race, the Chiles girls took home a consecutive team win with 45 points. The Timberwolves had three girls in the top 10 with Emily Culley running a 18:04 to lead the way with a fifth place finish. Caitlin Wilkey and Alyson Churchill worked together to finish seventh and ninth in 18:11 and 18:16. Abby Schrobilgen finished 17th in a time of 19:12 and Olivia Miller and Megan Churchill worked together to finish 24th and 29th. The Chiles ladies had a 10 second addition in team average from last year, with an 18:39 over last year's 18:29. This championship win over a strong Osceola HS, is one that moves Chiles up in the record books and the only team this year to have a consecutive team title this season. With prestigious wins to their name, the Timberwolves are ready to go out with a bang this year, hopefully qualifying for the NXN meet in Oregon. In two weeks both Belen and Chiles along with many top teams and individuals from the state, will line up in Cary, NC for the Nike Cross Southeast Regional meet where both will compete for the opportunity to race at NXN in Oregon. We will be keeping a close eye on these speedy teams as we move into the post season.